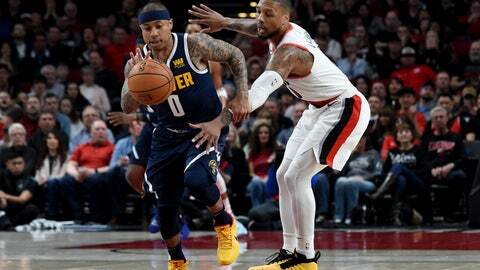 PORTLAND, Ore. (AP) — CJ McCollum’s return and a victory by the Lakers boosted the Trail Blazers on a night they also beat the Nuggets. Damian Lillard scored 30 points to lead Portland to a 115-108 win Sunday over a Denver team that rested its top three scorers. The Blazers got some help in their pursuit of home-court advantage by the Lakers, who beat the Jazz 113-109. As a result, the gap between fourth-place Portland and fifth-place Utah widened to two games with two remaining for both teams. And Portland got McCollum back after he missed 10 games with a left knee injury. Al-Farouq Aminu added 23 points and 11 rebounds for Portland, which snapped a six-game losing streak to the Nuggets. Gary Harris had 18 points for Denver, which played without Nikola Jokic, Paul Millsap and Jamal Murray. After trailing by 14 in the first half, Denver closed the gap in the second half and pulled to 92-91 on Torrey Craig’s 3-pointer before taking the lead on free throws. The teams traded the lead, but Juancho Hernangomez hit a 3-pointer that put the Nuggets in front 104-98 with 5:14 left. Lillard’s 3-pointer put the Blazers ahead 107-106 and Enes Kanter extended the lead with a layup with 2:18 left. Aminu added free throws and a reverse layup that made it 114-106 and sealed the win. Portland closed the game on a 17-3 run. Stotts said before the game that McCollum’s minutes would restricted, but he played 25 strong minutes and had nine points. The Nuggets defeated the Blazers just two days before. Jokic had 22 points, 13 rebounds and nine assists, and Denver clinched the Northwest Division title with a 119-110 victory Friday night. It was the team’s first division title in six years. The Nuggets were assured of at least the No. 3 seed in the Western Conference and can clinch the second seed with two more wins. They haven’t been the No. 2 seed since the 2008-09 season. But with home-court clinched, the Nuggets sat Jokic, Millsap and Murray against the Blazers. “We just want to make sure we’re healthy, rested and playing as well as we can going in,” coach Michael Malone said. Portland started the day just a game up on Utah for the fourth seed. The Houston Rockets held on to the No. 3 seed with a 149-113 win over the Suns, and were a game and a half up on Portland. The Nuggets led by eight points in the opening minutes, but Portland caught up and took a 29-25 lead going into the second quarter. Portland stretched the lead to 14 before heading to the break with a 60-49 lead. Portland reserve guard Seth Curry, who sat out Friday’s game with leg soreness, came off the bench to lead all scorers with 11 points at the break. The Nuggets closed the gap in the third quarter, outscoring Portland 12-2 to get within 73-72 on Lyles’ basket. Denver was unable to pull in front. Nuggets: Denver won the previous five games against the Blazers. … Denver missed out on the playoffs for the past two seasons. … Mason Plumlee fouled out with 1:38 left. Trail Blazers: Portland went 8-2 without McCollum. … Kanter had 11 points and 13 rebounds for his fourth double-double in five games. … It was Aminu’s first game with at least 20 points and 10 rebounds. With his first 3-pointer, Lillard passed his franchise record of 229 3s set in the 2015-16 season. With his second, he reached 1,500 for his career. … Lillard has scored 2,047 points so far this season, a new career high. He ranks fourth on the Blazers’ single season list. Nuggets: At Utah on Tuesday before hosting Minnesota on Wednesday to end the season. Trail Blazers: At the Lakers on Tuesday before wrapping up the season at home against Sacramento on Wednesday.